Wands come in a wide variety of stones and crystals, so there are many different wands to choose from. Different stones have different healing energies and, therefore, have different effects on the body, aura, and chakras. As each gemstone has different healing properties, it is nice to have a variety of wands to use for a variety of different purposes. You might, therefore, wish to build a collection of wands made from a variety of gemstones. A clear quartz crystal wand is a very good stone for beginners to work with as it is an all-purpose healing stone, having the ability to heal any ailment on any area of the body or aura. This makes it a good stone to have for your first wand. 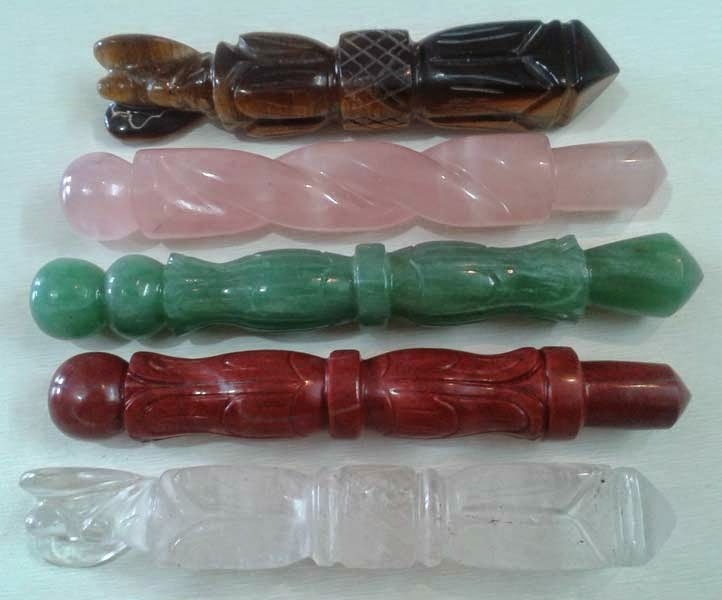 When selecting a wand to use for a specific purpose, you should choose one made from a stone that is suitable to your intention. Therefore, it is good to know a little about the healing properties of different gemstones so that you are able to select a stone that harmonizes with the purpose for which you wish to use it. For example, to heal a broken heart, the best and strongest stone to use when dealing with love and emotions is rose quartz. But if you tried to use Sodalite, for instance, it wouldn't do much, if anything, in helping to mend your broken heart, as its primary properties are centered around communication and thought. If, however, you are lost as to which stone to choose, clear quartz is always a good choice. Before using your wand, you may wish to spend some time with it to become familiar with its energy and to harmonize with it. The better you know your wand, the more effectively it will work for you. You can hold it while you meditate, or just sit holding it and feeling its shape, texture, and weight, and visually examining it to familiarize yourself with any patterns or changes in color it may have. You can also sleep with your wand, or even take a bath with it. Spending time with your wand will not only help to you become attuned to it, but you will also be receiving its healing energies at the same time. It is the power of one's intention that drives the energy of a wand, so it is a good idea to program your wand for its intended purpose, especially if it is specific. 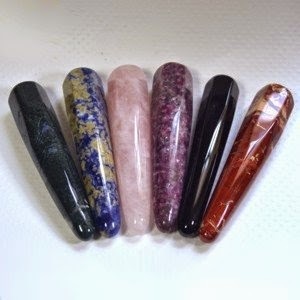 For example, if you want some crystal help with lowering your high blood pressure, you might choose a stone such as tourmaline, as it helps with many types of blood conditions. But tourmaline is also beneficial for many other areas of the body (the lymph nodes, spine, and endocrine system, for example), as well as for many other types of ailments (earache, insomnia, laryngitis, and epilepsy to name a few). And so you may wish to give your tourmaline specific programming so that its energy is focused on lowering your blood pressure. If you have chosen a stone whose healing properties fit well to your intention, the wand should readily and easily accept programming. (Read more about how to program a gemstone or crystal). 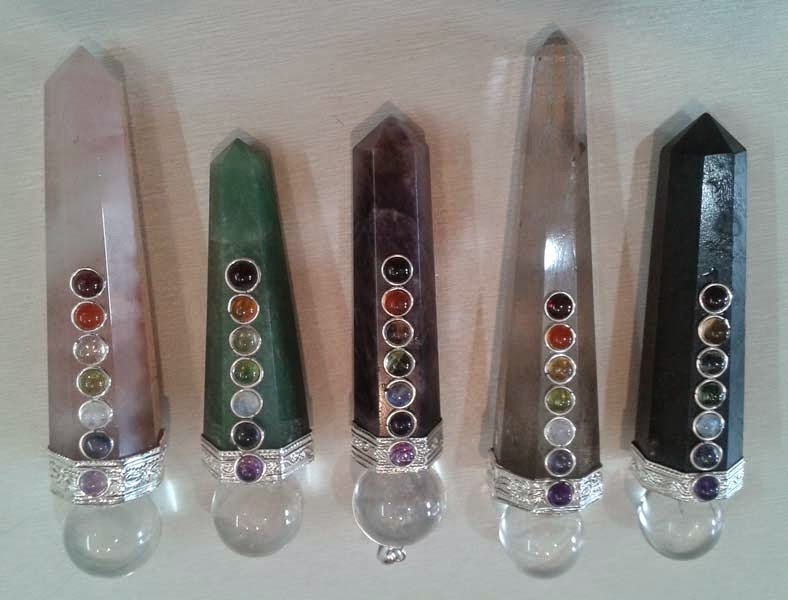 Crystal and gemstone wands should always be cleansed and recharged after usage, especially when it is being used on multiple people or for multiple purposes. Otherwise, any harmful or negative energies the stone has removed from one person may be transferred to another. The easiest and most efficient way to cleanse a wand is to soak it in water for 12 to 24 hours. (Make sure first that your stone is not one that can be damaged by water.) And the best way to recharge your wand is to leave it out in the sun for an hour or so, or leave it out under moonlight for an entire night, which works best when the moon is full. There is no right or wrong way to work with a wand. There are, however, a few common basic methods. These methods are not set in stone, but are merely a rough guideline to help you to get started. A big part of working with stones, whether or not you are using them for healing, is listening to your intuition. The energy vibrations of a stone will speak to you if you listen. As you work with your wand and gain experience using it, you will eventually come up with a method which works best for you and your wand(s). 1) Begin by drawing the "bad" energy out of the affected area. Do this by holding the wand over the wound (it is not necessary to touch the body with the wand) with the point pointing away from the area being healed. While doing this, picture in your mind the crystal drawing the negative energy out of the body, through the crystal, and then out the pointed tip. Some people also draw a circle or spiral in the air above the wound by waving the wand in a counter-clockwise direction as they move it over the afflicted area. Some people speak out loud in prayer, or repeat the intention, or speak other words of healing. Again, there is no right or wrong way to do this. Use your intuition and go with what you feel is best. 2) To replace the negative energy with positive energy, and thereby heal the problem area, do the opposite. Hold the wand point down over the afflicted area as you visualize healing energy coming down into the crystal, through it, and then into patient's the body in a focused beam of energy. If you waved the wand counter-clockwise when drawing out the negative energy, then wave the wand over the area in a clockwise motion. If you spoke words during the removal of the bad energy, you may wish to also speak words while the problem area is infused with healing energy. Use your intuition to determine when the healing is complete. It could take anywhere from one minute to 15 minutes or even longer. After completion, some people say a prayer of thanks. 1) It is easiest to have the patient in a laying down position. Begin wherever on the body you wish and hold the wand horizontally over the patient, but not touching the patient. Slowly move the wand over the entire body. As you do this, take note of any areas in which the wand feels different. It may vibrate, or become warm, or feel harder to move, or feel heavier. These are the areas where there are blockages in the aura or chakras. 2) Once you have finished scanning the aura, go back to the blocked areas and use the wand in the same way as above, first removing the negative energy, and then replacing it with positive energy. With the patient lying down, hold the wand point up and move it over the body slowly in small counter-clockwise circles beginning at the feet. Whenever you feel that there is a blockage, pause at the area and remove the negative energy as before. If you feel the need to change the wand's movement, then do so. Once the area feels clear, return back to the counter-clockwise movement and continue scanning the body up towards the head, stopping again whenever you sense there is a blockage. When you reach the crown of the head, reverse the wand so it is pointing downward, and swing the wand over the patient's body in small clockwise circles, working your way back down to the feet. This will recharge the energy fields in the aura and chakras. If you once again feel an area of blockage, turn the point back upwards and remove the bad energy until it feels cleared. Then turn the point back downwards and return to waving the wand in small clockwise circles over the body, beginning with the area that was just unblocked. Note: Again, there is no right or wrong way to do this. Just listen to your intuition to find the way that is best for you. For more products related to crystal visit to my shop. Author Michael Gienger - Healing Crystals As I love the crystal and so I keep wonderful collection of crystal related books and taken from these books.